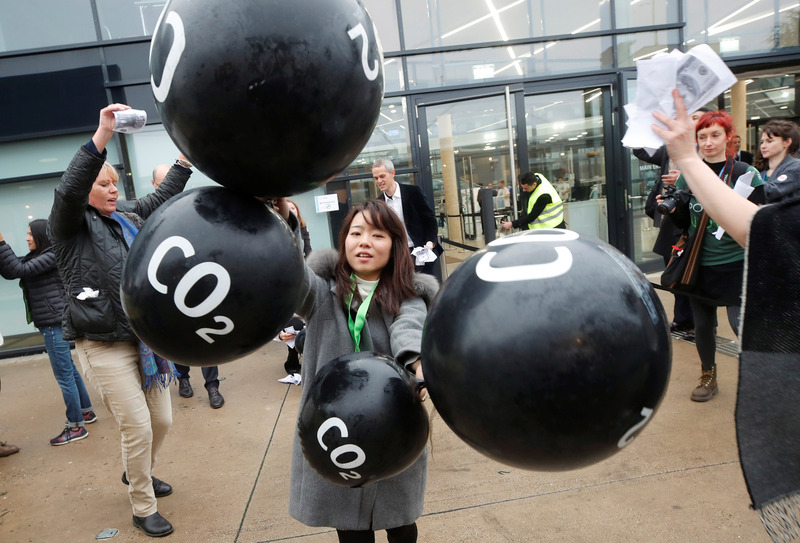 Activists protest against carbon dioxide emissions trading outside the World Conference Centre Bonn, site of the UN Climate Change Conference (COP23), in Bonn, Germany, on November 17, 2017. Pipeline protests and carbon tax debates. Scientific evidence dismissed as fake news. Environmental dangers versus the promise of good jobs. Where does action on climate change intersect with politics? What should developing countries be expected to give up when wealthy nations ask them to reduce emissions? If fossil fuel divestment is so simple, why does it get so complicated? We tackle questions like these at the Munk School as we examine the social, political and economic dimensions of sustainability. Munk One students, under the supervision of Prof. Teresa Kramarz and Dr. Donald Kingsbury, conduct environmental politics research in Ecuador. Photo: Stephanie Xu/raw + rove. In 2017, Prof. Teresa Kramarz joined her colleagues Prof. Steven Bernstein and Prof. Matthew Hoffmann as the third co-director of the Munk School’s Environmental Governance Lab (EGL). Prof. Kramarz’s research already figured prominently at the EGL. In 2014, she launched an international task force on accountability in global environmental governance, linking 46 senior and junior researchers in leading universities across Asia, Australia, Europe and the Americas. The task force holds regular workshops, roundtables and panels, and in 2018 it is hosting the Summer Institute on Critical Studies of Environmental Governance at the Munk School. These fruitful exchanges have so far yielded special issues of the journals Global Environmental Politics (2016) and Review of Policy Research (2017), as well as a forthcoming volume to be published by MIT Press. The task force is part of the Earth System Governance Project, the world’s largest research network of social scientists working on questions of governance and environmental change. 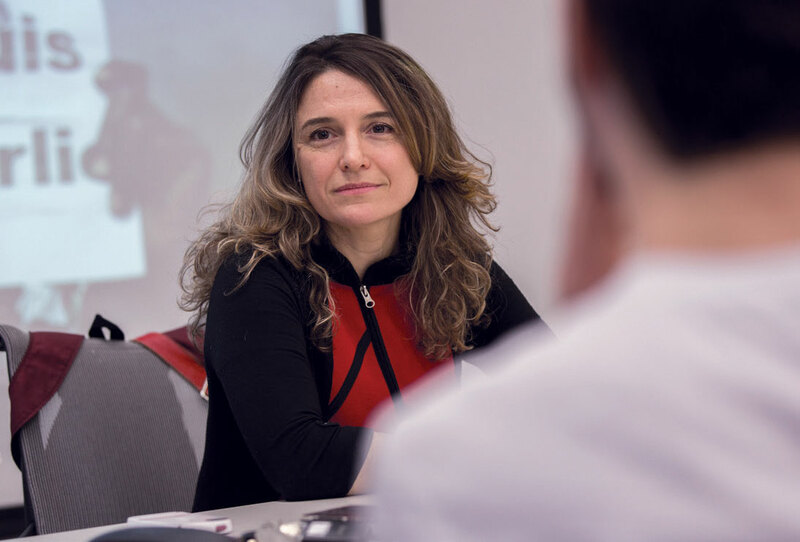 In leading one of the project’s three North American research centres at the EGL, Prof. Kramarz draws on her expertise in the World Bank’s public-private partnerships and their influence on democracy, innovation and financially sustainable conservation. She also investigates democratic accountability in environmental politics and leads an emerging research program on the impacts of resource extraction in Latin America. The director of the Munk One undergraduate program since its launch in 2013, Prof. Kramarz is also strengthening the linkages between EGL-based research and the Munk School’s teaching programs. 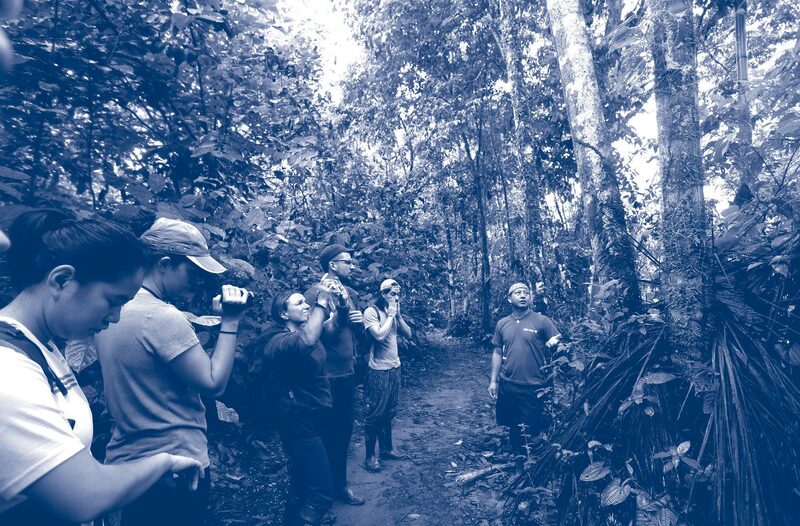 For example, her recent research trip to South America provided a unique opportunity for graduate and undergraduate students to extend their education from the classroom into the field, as they joined expert researchers in the Ecuadorian Amazon. Working alongside Prof. Kramarz, they also benefited from her many years of experience with sustainable development programs led by the World Bank, the United Nations Development Programme, the Food and Agriculture Organization and the Canadian International Development Agency. Prof. Randall Hansen introduced the secretary-general, highlighting how the OECD report connected to Prof. Kramarz’s work with the Environmental Governance Lab. Gurría gave a timely speech, delivered just before the annual meeting (in Bonn) of COP23, which brings together signatories to the United Nations Framework Convention on Climate Change. 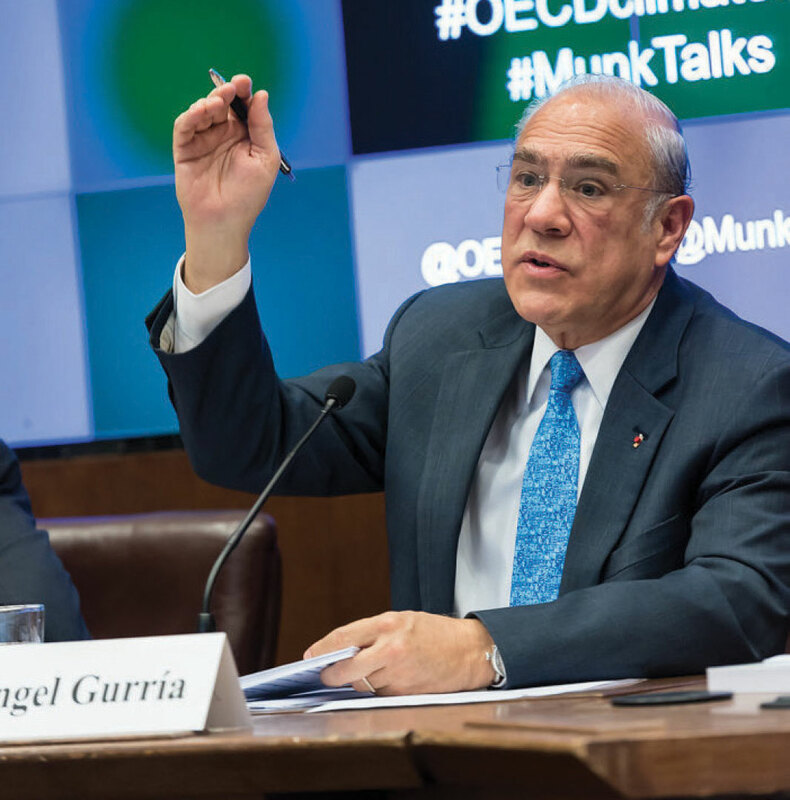 Addressing an audience of influencers in the climate change arena, as well as representatives of government, civil society and the local community – and, of course, Munk School students, researchers and faculty – Gurría wove recent political events into his assessment of key challenges to achieving the goals of the 2015 Paris Agreement. The talk provided a fascinating glimpse into how the problem of climate change is being tackled by the OECD, an intergovernmental organization dedicated to stimulating economic growth and international trade. In calling for countries to look beyond their borders to address this global challenge, the secretary-general reinforced the OECD’s commitment to a broad, inclusive approach that takes into account the sustainability perspectives of all stakeholders, including the world’s indigenous peoples. 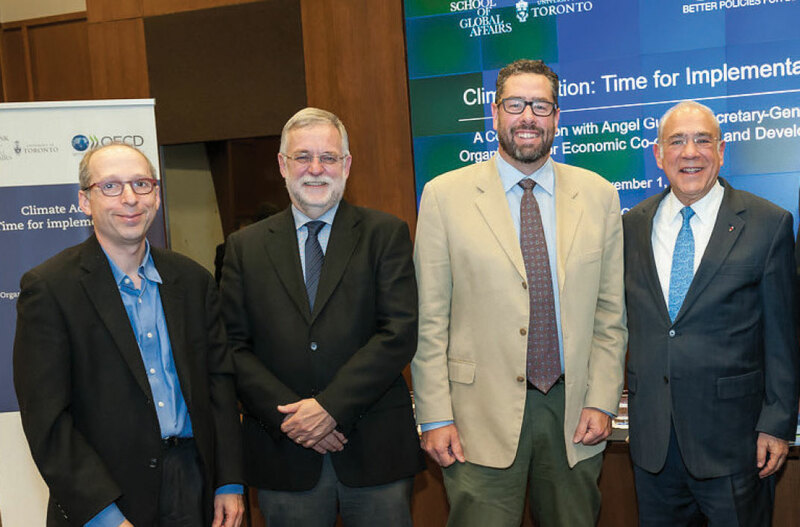 (left to right): Steven Bernstein, co-director, Environmental Governance Lab; John Robinson, professor, Munk School of Global Affairs; Matthew Hoffmann, co-director, Environmental Governance Lab; and Ángel Gurría, OECD secretary-general. (left to right): Daniel Sanchez Casillas and Bruce Cinnamon. Fossil fuel divestment – the decision to shed stocks, bonds and other investment vehicles connected to companies that extract hydrocarbons – has been widely embraced, at least conceptually, by organizations aiming to help mitigate global climate change. But what is the current state of the divestment movement, particularly in the public sector? How do entities such as municipal governments assess exposure, choose to divest and implement their decisions? What has been the impact – financial, environmental and economic – of the movement so far? These are core questions in a new MGA Capstone Project led by Munk School faculty member Prof. John Robinson, a leading climate change expert with a cross-appointment to U of T’s School of the Environment. Participating second-year students are encouraged to examine some of the tough issues that arise from even the best intentions. For instance, how do elected leaders reconcile fiscal responsibility with what many see as a moral obligation to divest? And does divestment actually help to redirect investment away from carbon-intensive industries – or could it compromise the fiduciary duty of officials who manage public pension funds and other taxpayer-funded investments? 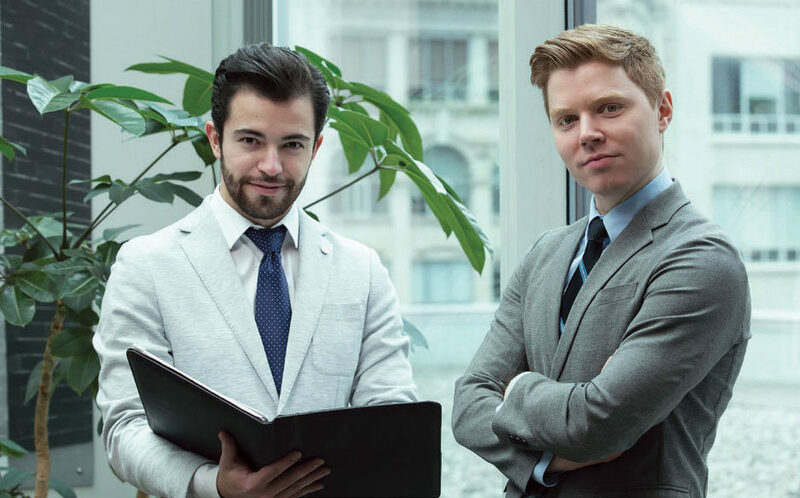 This is one of three environmentally focused projects Prof. Robinson led in 2017 for the MGA Capstone program, which creates opportunities for students to work with real-world clients, sharing analytical insights and, where possible, helping to build innovative solutions. 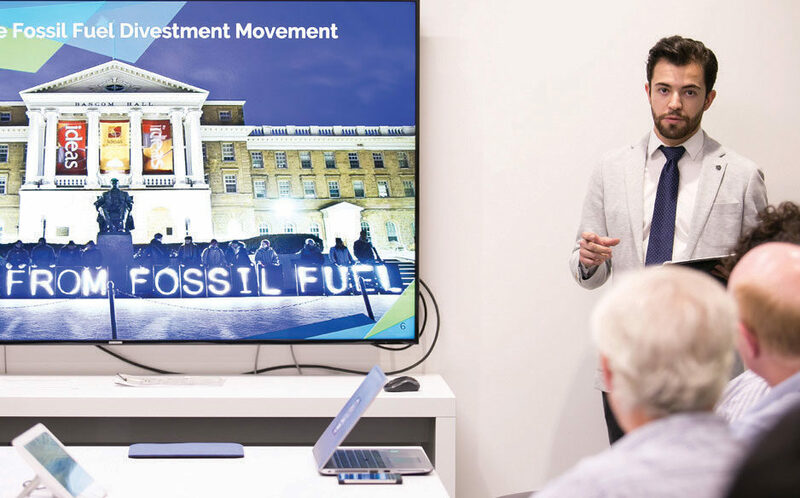 The divestment Capstone brought students together with officials from the City of Toronto, which is looking at divestment options in the course of reviewing its overall investment policy. 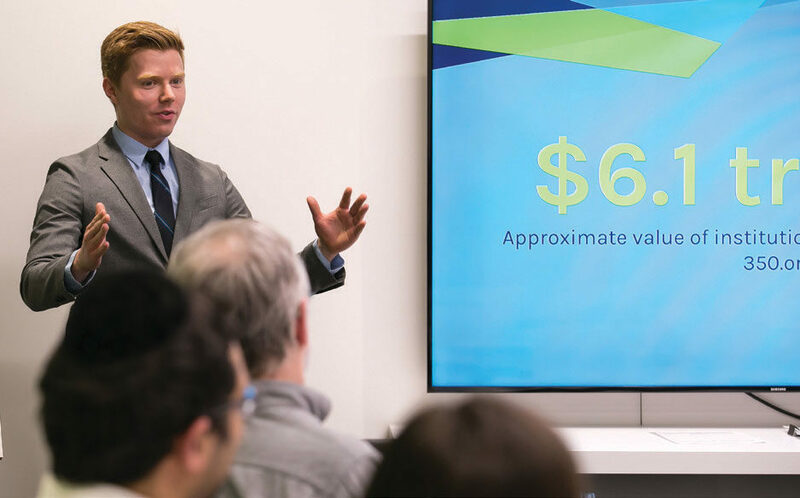 The students’ final report was presented at a June 2018 meeting of the City’s newly formed Investment Board.